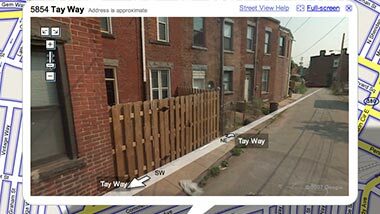 Google Maps has expanded its Street View feature to six new cities and Pittsburgh made the cut. Follow that link and watch the blue tide of streets where you can travel, online, up and down and 360 around them. It’s completely amazing the amount of camera angles here, and that you can literally navigate the streets of our city from the comfort of your own laziness, er couch. There’s no telling what types of things you’ll be able to find on here, for example, a not-yet-burned-down Harris Grill is alive and well on what appears to be a sunny blue afternoon. Just incredible!!! I love how our neighbours chairs are out as usual. I’m assuming this is all based off satellite technology, which is pretty mindblowing considering the detailed views. Wow. Please post this on yummy! I can’t imagine it’s satellite technology, how could a satellite take a picture from the street level? I’m almost thinking some guy walked around and took all of these photos, or is that crazy? Anyway, this may be gone by next year, as the company who is licensing the tech to Google is supposedly backing out. And yeah Shawn, bummer about Alder, I guess you’ll just have to rush home if you want to panoramically view that sweet old homelife of yours.